Taken in the dining room where the views of the glittery city skyline will tempt you, are just the thing to set you for your day’s exploration. Choose your starter from a range of cereals or fruits from our breakfast bar and then make your choice from our full English breakfast range or touches of traditional savors, with as scrumptious tea, coffee and toast as you can drink and eat. Breakfast is served daily 06:00 – 10:30. Brunch is available from 11:30 – 15:00 on Saturday and Sunday offering unlimited flow of wide Coffee and Tea varieties. Our delicious Dinner buffet and a-la carte courses range from local specialties to international cuisine and include: appetizers, meat, poultry, fish, vegetarian and fresh seasonal salad dishes, side orders, dessert and assortment of Coffees and Teas. Dinner is served 18:00 – 22:00 (Sunday – Thursday) and 18:00 – 22:30 (Friday – Saturday). Collage All Day Dining, is a fusion of modern style, cutting-edge design and peerless standards with excellent views and natural daylight. 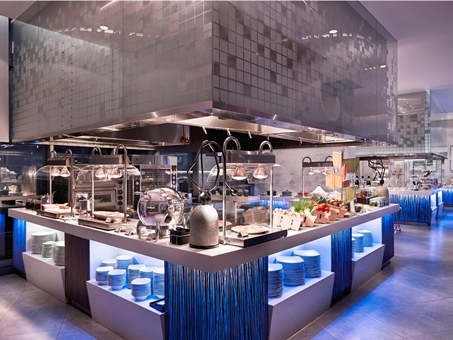 Situated on a high floor, it presents unparalleled magnificence both day and night with the extensive selection of innovative cuisines of buffet, a la carte and the checf’s specials designed to suit all tastes through breakfast, lunch and dinner. 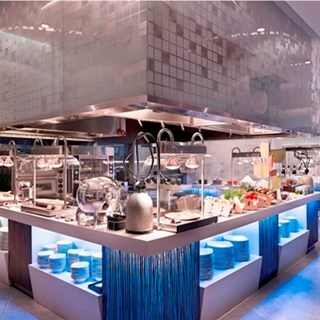 Showcasing international flavors and local favorites on buffet or á la carte. It would be hard to find a more relaxing place to dine than in our spacious dining room, which can seat up to two hundred persons excluding the terrace area. Offering tempting Breakfast, Lunch and Dinner menus, as well as an extensive Brunch on the weekends, there is plenty of selections for all tastes for a well presented quality of Food and Beverages. My first visit to Collage. Service provided by Manager that evening was excellent. He is friendly and very attentive to feedback. However, our ala carte meal was poorly prepared and extremely slow. Most of the side dishes were taken from buffet - satay, prawn fritters which tasted cold, hard and aweful. For normal buffet I think still okay, but yesterday for valentine event, I am expecting something significantly special than just flower and a bit of wine. My advise, next time to do special event, plan your food variation accordingly not to mention the flow of event is can't be just a light music. Too bad since this is pullman level. Came here for Christmas dinner with boyfriend. ambience and music quite nice, food and drinks are okay, and they served christmas themed cookies. the cookies look cute but taste just okay. The buffet way too small, it did not have lots of variety, the food did not the right way and we only got water all night ?? was not worth Rp. 548.000,- ! It was our first time at Collage but sorry to say, its gonna be our last time. You need to check Anigre, Sheraton Gandaria City. Below your price but the buffet is EXCELLENT !!! All you can eat food not available everyday like in other hotel. Waiter that not to friendy to serve. When we eat ala carte. I already try many hotel restaurant in jakarta. Never being serve like this waiter. there are not much options for beverages. There are much variations for foods and deserts, but I don't find the taste satisfying. Also it's kind of far from my expextation. But over all the service was excellent. The restaurant isn’t really spacious. The food quality is very good especially for the seafood. The free flow drinks only water, tea and coffee. Suasananya nyaman, makanannya juga enak-enak. Yg pasti worth the price! Need to be more attentive about the quality of the food as food served is not cooked well. Ambiance was good but taste just ok. Service was excellent. Collage Dining is worth for money, all staff is friendly. Makanan dan pelayanan sangat menyenangkan. Akan lebih baik patung anak anak di collage restaurant dan yg di lobby diganti dengan karya seni lainnya. Patung anak anak tsb cukup menyeramkan. valentine dinner with awesome juicy wagyu steak and cocktail...perfect combination.. In the middle of enjoying our dinner, we were asked to move to another table which we found it was so inappropriate for a 5-star hotel service. We were quite disappointed for the service and how the waitress still persistent to ask us to move even though we had tried to reject it politely at first.